Legendary hip-hop group Souls of Mischief announce that they’re releasing a conceptual collaboration with renowned producer and multi-instrumentalist Adrian Younge entitled There Is Only Now on Adrian’s newly launched record label, Linear Labs on August 26th, 2014. Inspired by a near-fatal incident involving group members A-Plus, Opio, Tajai, and Phesto early in their careers, the unique and cinematic crime tale creatively and expertly weaves stories of love, loss, and revenge throughout the entire album. Set in 1994, There is Only Now serves as a bookend to two decades of music since the release of their seminal debut album, ’93 Til Infinity. 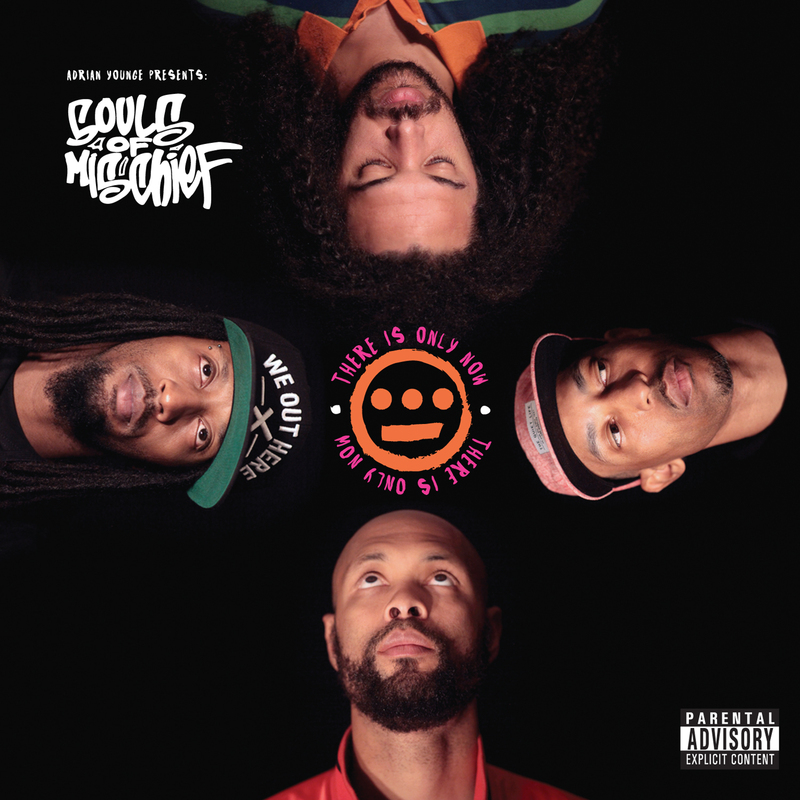 Souls of Mischief and Adrian Younge have created a hip-hop album like no other. Recorded solely on 2″ analogue tape, using only acoustic live instrumentation played mostly by Adrian himself, and recorded together as a group in one room, the project boasts incredible dedication, discipline, and skill sets that few others in the modern day can match. Adrian employed no computers, no drum sampling, and everything was recorded in one take. The result of a special moment for all involved, There Is Only Now proves that after two decades in the rap game hip-hop’s Fab Four remains committed to the expansion of their legacy as hip-hop innovators and pioneers. For more information/interviews for Souls of Mischief and Adrian Younge, contact Michelle or Rory. Starting with their landmark debut ’93 ‘til Infinity, Oakland’s four-person rap group Souls of Mischief has blazed the trail for hip hop’s evolution. Members Tajai, A-Plus, Phesto, and Opio have left their mark sonically, lyrically, and stylistically on Kanye West, Just Blaze, Big Sean, Big K.R.I.T., P. Diddy, Vampire Weekend, John Mayer, and many more who have cited them as cultural icons and influencers. Souls is also credited as having pioneered the independent label movement when they started Hieroglyphic Imperium Records in 1997 following their departure with JIVE Records, creating the infrastructure blueprint for other succesful independent hip hop labels. Co-founders of the Hiero label also include emcees Del Tha Funky Homosapien, Casual, Pep Love, and producer Domino. Souls’ also forged hip-hop’s relationship with the skate, surf, and snowboard communities after iconic skate brands included their music in their VHS videotapes in the mid-90’s. The group’s creative output and legacy as a whole continues to thrive, and they show no sign of stopping. In 2013, Souls celebrated the 20 year anniversary of ’93 til Infinity, prepped a documentary film, embarked on a 50-city “Still Infinity Tour,” and released a joint 20th anniversary limited edition tee shirt capsule collection with Ecko Unlimited. They are now prepping for the August 26th release of their sixth studio album, There Is Only Now, a cinematic collaborative effort with renowned producer Adrian Younge on Adrian’s newly launched Linear Labs record label.